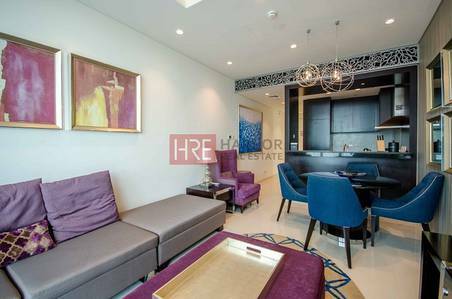 Elegant 2BR with Stunning Burj Khalifa View! The Distinction is a luxury hotel apartment project by DAMAC Properties, a leading private property developer in the Middle East region. The tower consists of 53 floors with amazing views of Dubai Fountain, Mall, and the tallest tower in the world, Burj Khalifa. As residents they will enjoy the following highest quality amenities and facilities offered in The Distinction: Grand Lobby, State of the Art Gymnasium, Coffee Lounge on the Ground Floor, Sauna, Spa, Swimming Pool, 24 Hour Reception and Concierge Desk, 24 Hour Valet Parking Service, Car Parking, and Global Dining Restaurant. The Burj area is an upscale mixed-use community combining commercial, residential, hospitality, entertainment, shopping and leisure facilities in open green spaces scattered with lakes and fountains. An inspired urban concept, this illustrious part of town is home to the worldu2019s tallest tower, its largest shopping mall, iconic fountains and a host of other first-class amenities.